Reducing the burden of accessing foreign markets has been a priority of the WTO. The main component of the Bali Package is an agreement on trade facilitation (WTO 2013). Notwithstanding these efforts, most firms in most countries neither export, nor import (Bernard et al. 2007, Wagner 2012). This is curious given the large positive effects of imports on firm productivity (Amiti and Konings 2007, Halpern et al. 2015),and of exports on firm size and survival (Bernard and Jensen 1999). One explanation for this lack of market access is the presence of informal trade barriers, when specific knowledge, or a trusted partner, is needed for a productive trade relationship. When informal barriers are active, importing may diffuse from firm to firm through personal and business connections. Mion and Opromolla (2014), Mion et al. (2016), Fernandes and Tang (2014),and Kamal and Sundaram (2016) document such diffusion for exports, but at present we have limited evidence on the equally important import-side of the market. In a recent paper, we use firm-level data from Hungary to document and analyse knowledge diffusion in importing (Bisztray et al. 2018). We study spillovers in two networks: spatial and managerial. In the spatial network, peers are neighbours in the same or proximate buildings. In the managerial network, peers are linked through managers moving between firms or being active in both firms at the same time. The key concern with estimating spillovers is one common with studies of peer effects (Manski 1993)– that a firm and its peer's import choices may be correlated for reasons unrelated to learning. For example, firms in a particular industry may make correlated location and import decisions. Our research design rules out many alternative explanations, and helps to isolate trade spillovers in spatial and managerial networks. Specifically, we ask if having a peer which has past experience with a given country increases the probability of starting to import from that country, rather than from another country. To increase comparability we only look at four source countries, similar in terms of imports: the Czech Republic, Slovakia, Romania, and Russia. To ensure that all firms are the same distance from the border, we only consider firms located in Budapest. In our baseline specification, we find that having a same-building peer with import experience from a specific country increases the probability of starting to import from the same country by 0.2 percentage points. This roughly doubles the baseline probability of starting to import from one of the four countries. We find similarly strong effects for export spillovers and spillovers along the managerial network, consistent with the earlier literature. One remaining concern with our estimation is that it may be subject to some spatially-concentrated and country-specific omitted variable. For example, a Russian translating agency within an office building may make it easier for all firms in that building to trade with Russia. These firms would benefit from the presence of the translating agency, not from the import experience of one another. We address this problem by exploiting plausibly exogenous firm moves. We ask what happens when a firm with country-specific import experience moves to an address where no such experience was present earlier. The move is a positive shock to local country-specific knowledge. We compare buildings where the newcomer has country-specific import experience to buildings with inexperienced newcomers. Figure 1 shows the estimated difference in the fraction of importers in buildings with experienced newcomers, relative to buildings with inexperienced newcomers. 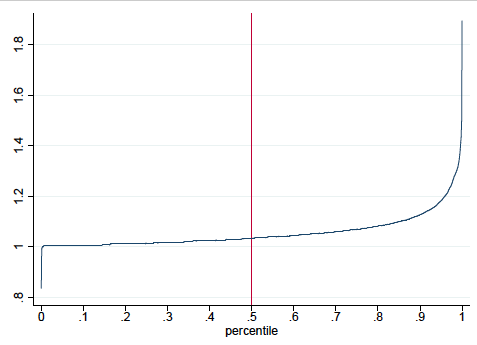 The dashed lines show the 95% confidence interval, with standard errors clustered by building. 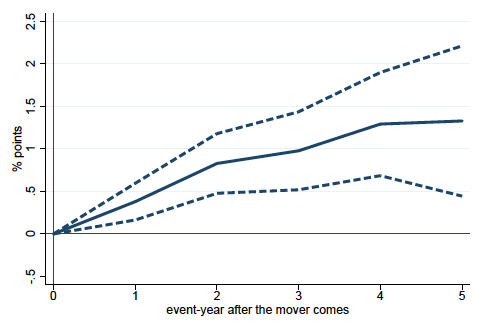 We find that firms start to import from the country known by the mover with a higher probability than from other countries, relative to firms in addresses where the mover had no such experience. Consistent with the logic of diffusion, the response of imports to the move is gradual. The magnitude of the estimate is comparable to that of our first research design. Peers have much lower influence if they are not in the same, but neighbouring buildings. The neighbour-building peer effect is about a fifth of the same-building peer effect, indicating fast decay by distance. Given the average distance between two neighbouring buildings (28 meters), our estimates imply that spillovers decline by 5.6% for every meter. This value is comparable to but somewhat higher than other estimates of within-city decay of spatial spillovers. (See Arzaghi and Henderson 2008on networking benefits among advertising agencies in Manhattan, Rossi‐Hansberg et al. 2010on housing externalities in Richmond, and Ahlfeldt et al. 2015on production and residential externalities in Berlin.) The main common feature of these results and ours is that they all represent fairly strong decay – knowledge spillovers appear to be highly spatially concentrated. And the fact that our estimate is the highest suggests that in our context, building boundaries are important barriers to diffusion. Our decay parameter estimate may be useful for calibrating urban economics models that feature knowledge diffusion of business practices such as importing. We also investigate the factors associated with stronger diffusion. We find that knowledge flows are stronger when firms or peers are larger or more productive and when there are more experienced peers present. Knowledge flows also exhibit complementarities in firm and peer productivity, showing that positive sorting can increase the overall adoption of importing. Spillovers are stronger between peers in the same industry, but are also positive across different industries. What are the implications of these estimates for trade facilitation? Because of the positive spillovers between firms, there exists a social multiplier (Glaeser et al. 2003)– inducing one firm to export or import will, over time, induce additional firms to do so. Without proper targeting, however, the social multiplier tends to be small. Inducing 1,000 median firms to import will lead to only 16 additional importers over five years. There is, however, considerable heterogeneity in the magnitude of the social multiplier. More productive firms learn faster, especially from more productive firms. And knowledge spreads faster in large office buildings and industrial parks, where there are many potential peers. Figure 2 shows the distribution of the five-year social multiplier, which is 1.13 for the firm in the 90th percentile. Indeed, targeting the 1,000 firms with the highest potential for a spillover induces 285 additional new importers. Thus, while accounting for spillovers is not important for the typical firm, it is potentially quite important for a substantial share of firms. An implication is that there may be significant gains from targeting trade facilitation. Our result quantifies the benefit of clusters, especially of firms with high productivity, in facilitating the diffusion of good business practices. Ahlfeldt, G M, S J Redding, D M Sturm and N Wolf (2015), “The economics of density: Evidence from the Berlin Wall,” Econometrica: Journal of the Econometric Society 83(6): 2127–89. Amiti, M and J Konings (2007), “Trade liberalization, intermediate inputs, and productivity: Evidence from Indonesia,” American Economic Review 97(5): 1611–38. Arzaghi, M and J V Henderson (2008), “Networking off Madison Avenue,” Review of Economic Studies 75(4): 1011–38. Bernard, A B and J B Jensen (1999), “Exceptional exporter performance: Cause, effect, or both?” Journal of International Economics 47(1): 1–25. Bernard, A B, J B Jensen, S J Redding and P K Schott (2007), “Firms in international trade,” Journal of Economic Perspectives: A Journal of the American Economic Association 21(3): 105–30. Bisztray, M, M Koren and A Szeidl (2018), “Learning to import from your peers,” Journal of International Economics 115(November): 242–58. Fernandes, A P and H Tang (2014), “Learning to export from neighbors,” Journal of International Economics 94(1): 67–84. Glaeser, E L, B I Sacerdote and J A Scheinkman (2003), “The social multiplier,” Journal of the European Economic Association 1(2-3): 345–53. Halpern, L, M Koren and A Szeidl (2015), “Imported inputs and productivity,” American Economic Review 105(12): 3660–3703. Kamal, F and A Sundaram (2016), “Buyer–seller relationships in international trade: Do your neighbors matter?” Journal of International Economics 102(September): 128–40. Manski, C F (1993), “Identification of endogenous social effects: The reflection problem,” Review of Economic Studies 60(3): 531–42. Mion, G and L D Opromolla (2014), “Managers’ mobility, trade performance, and wages,” Journal of International Economics94(1): 85–101. Mion, G, LD Opromolla and ASforza(2016),“The diffusion of knowledge via managers’ mobility,” CEPR Discussion paper 11706. Rossi‐Hansberg, E, P‐D Sarte and R Owens (2010), “Housing externalities,” Journal of Political Economy 118(3): 485–535. Wagner, J (2012), “International trade and firm performance: A survey of empirical studies since 2006,” Review of World Economics 148(2): 235–67. WTO (2013), “Agreement on trade facilitation” WT/MIN(13)/36, WT/L/911, World Trade Organisation.